Schneit es monentan in Hakuba Cortina Kokusai ?Vielen Dank! Hakuba Cortina Kokusai, in Japan (located in the Nagano prefecture), is a medium sized ski resort with 7 ski lifts that offers skiers an impressive 709 metres (2326 feet) of vertical descent. Hakuba Cortina Kokusai has 16 pistes. Hakuba Cortina Kokusai is suited for all levels of skiers and snowboarders. 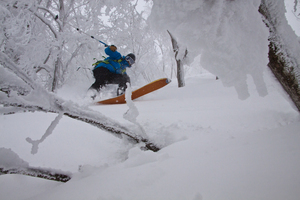 This area regularly receives the most snow in the Hakuba valley. The nearest train station to Hakuba Cortina Kokusai is at Minami Otari. I have skied in Argentiere, Tignes, St Anton, Verbier, Mammoth Mountain, Lake Tahoe, but none can match Hakuba Cortina for value, amount of skiing per lift, stunning views, quality and value of food. Cortina is linked to a resort perfect for family skiing, and also greater selection of eating places. Today we paid 4500 Yen for a pass covering the two areas. Everyone's so friendly and helpful. It's amazing being greeted on and off lifts! Around Hakuba we've skied Happo, Goryu, Hakuba 47, but Cortina is really special. Easy to get to on shuttle bus from Happo information centre 500 Yen each way. Lesen Sie 3 andere Beurteilungen ueber Hakuba Cortina Kokusai oder geben Sie Ihre eigene Bewertung ab.